K. Chin's most popular painting. 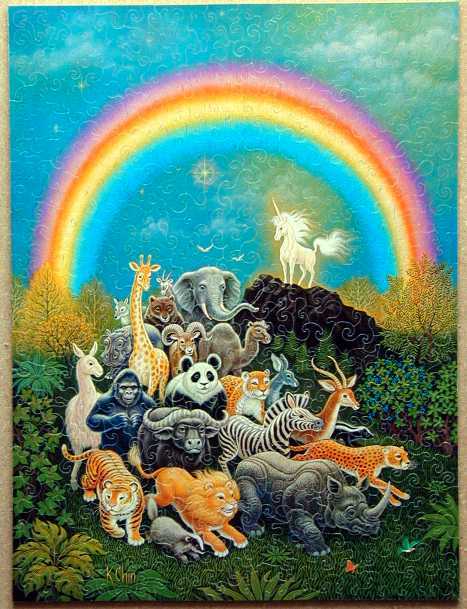 This puzzle features K. Chin's most popular print, "We have to believe in Rainbows". This puzzle is the largest one I've cut to date. I used a more conventional strategy with the edges: most of them are directly interlocking, while some are Indirectly Interlocking. Overall, this puzzle is very solidly interlocking and may be picked up from an edge without any pieces dropping out. 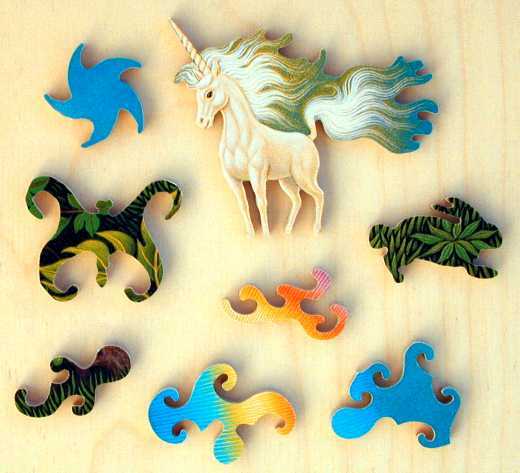 There are several figurals, and a "treat piece": the Unicorn - like the Unicorn in Puzzle 23 - is a single piece. Worked on Puzzle #25 today. About 40% done. Perhaps because the puzzle is bigger than any I've made before I felt I had more room to "roam" with the saw - also I'm becoming a little more conservative about the width of the curls. As an unintended byproduct, the pieces are a bit bigger than my other recent Swirl Curls. Should come in around 340 pieces, still a record for the Swirl. The poster is very high quality with vibrant colors and did not require lamination. Late - Finished cutting #25. An excellent puzzle and will be placed on eBay soon, will post it tomorrow. My Swirl Curl style still evolving a bit, and one piece in the puzzle is "historic" [the piece below the unicorn, second picture, above], a piece which may spawn a new cutting style in some puzzles yet to be.